here's an excellent unbiased review and discussion of a couple of our preamps . . . .
a 4 tube line stage only preamp, 4 inputs, 1 output, remote control input and volume !! Our newest preamp, a real bargain, better than any other tube preamp I've seen under $800 !! personally and throughly checked this out, it's now in my own personal system. This preamp is extremely well built, solid heavy chassis, excellent circuit design, and great sound from four 12AX7 tubes. The assembled/tested/warranteed version will cost you much less than I could build it for. Included is a remote control for motorized volume (ALPs volume control) and relay selection of four inputs. One output, no tape loop, no tone controls, just a super nice package that delivers excellent tube audio music. I'm not selling a full kit, because that would cost much more than this fully assembled/tested unit. but not the remote input selector, although there are dozens of those available if you want to look elsewhere. Size is 12.5" wide x 12.5" deep x 4.0" tall and it weights a hefty 9#. this is our most popular preamp, and probably the best value for your $$$. with conventional volume & balance controls, $1120 plus $40 shipping in USA. (21 step volume and dual gain/balance) $1120 plus $40 shipping in USA. 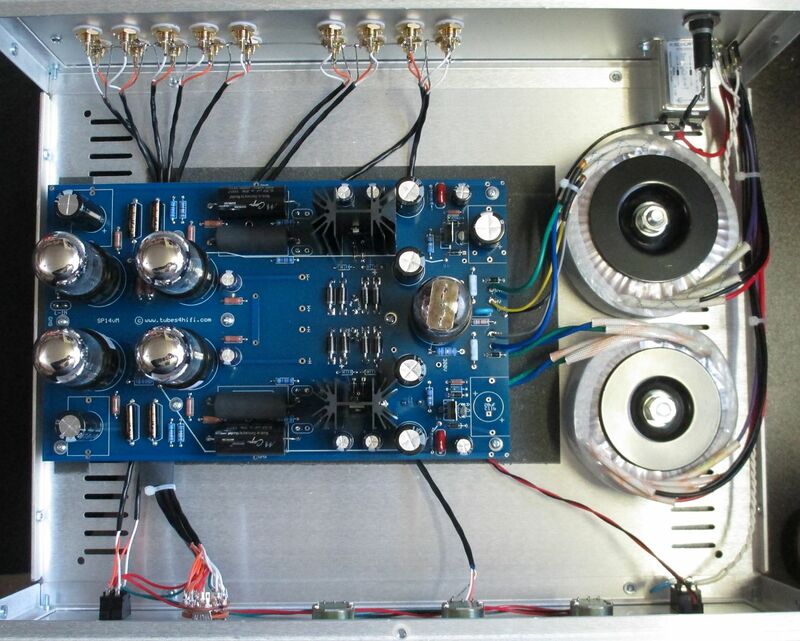 this is our very best preamp, using larger 6SN7 octal tubes, in a larger 5" tall chassis. Same circuit circuit design as our SP13 but on a much larger PCB, with NO room to add a phono section inside. NOTE: For phono use with this preamp, you'll need to add a separate phono preamp such as our premium PH14 or PH16 phono preamp below. 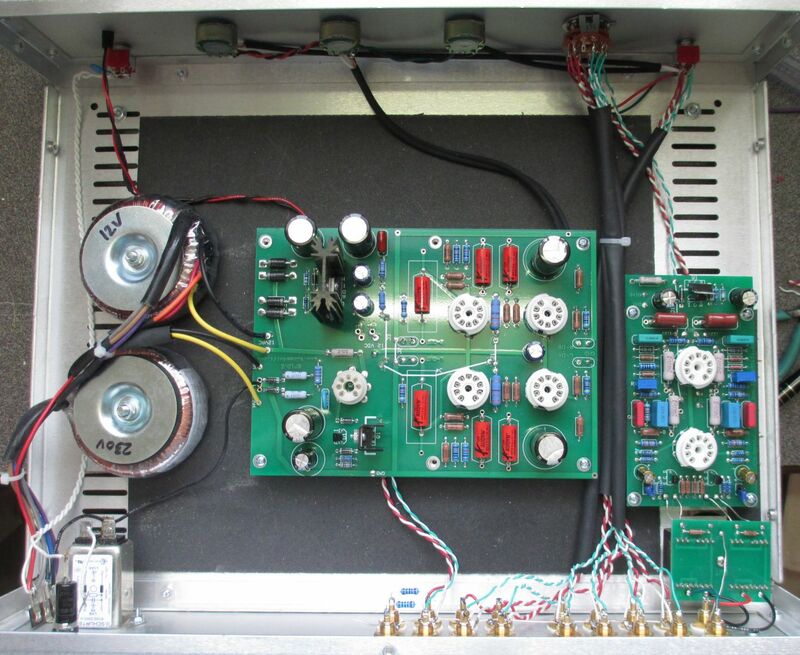 This preamp has dual mono regulated power supplies for each channel, for both B+ and filaments. STANDARD items include 21 step volume attenuator and dual mono gain/balance attenuators, iso-damping chassis, iso-mounts for the circuit board, and more. (21 step volume and dual gain/balance) $1450 plus $50 shipping in USA. This has a full power supply using tube rectification, with HV regulator and filament regulator. This circuit has a 12AU7 tube buffered output for lower impedance, better drive capability, and enhanced and perfected RIAA EQ. This is our very best phono preamp, this is a phono only separate preamp, and INCLUDES premium grade resistors and capacitor. gain is 45db use with MM cartridges or medium to high output MC cartridges.